Carabiner keychains, 3 day production; the level engraving area protects your promotional investment from wear and damage as most items that contact the carabiner, like keys, will do so on the edges as opposed to the level area where your engraving is. We also carry the "round" and "pear" shapes. One side engraving is included, and reverse side engraving is just .15 per. Great to promote your company name or logo on one side of your carabiner keychain, and advertising your Web address on the other. 80mm Engraving area: 1.875" x .187"
Carabiner Keychain seekers will appreciate that we offer "Level Best" Carabiner Keychains™ — carabiners that have an added step in the manufacturing process to make the engraving area level and flat, at no additional cost. The level engraving area protects your promotional investment from wear and damage as most items that contact the carabiner will do so on the edges as opposed to the level area where your engraving is. We also provide the "round" and "pear/bar" shapes as well — the "pear/bar" shape in particular is excellent for hanging items like tennis screens, etc. One side engraving is included, and reverse side engraving is just .15 per. Great to promote your company name or logo on one side of your carabiner keychain, and advertising your Web address on the other. U.S. lab certified lead-free — our carabiner keychains are 1st quality — they are 100% series-6000 anodized aluminum, providing a safe, tough, rich bright color and finish, and they are permanently and crisply YAG Laser engraved at no extra charge, as opposed to silk screened which is prone to flaking. Customized keychains are perhaps one of the most effective and popular ways of promoting businesses. 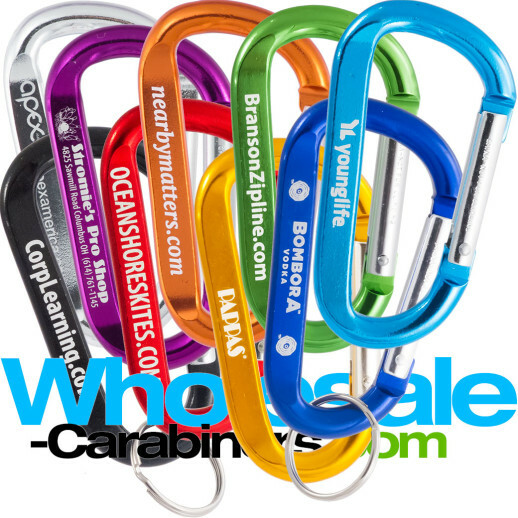 If you are looking to promote your business through the use of promotional keychains, you have landed at the perfect place: Wholesale-Carabiners.com is a leader in manufacturing truly custom and quality anodized aluminum carabiner keychains, offering the always popular personalized carabiner keychain in several attractive shapes and at always very economical wholesale prices. We provide personalized carabiner keychains in three sizes: 80mm (3.125"), 60mm (2.25") and 50mm (2"), engraving to display your company's name, logo or other message. As a manufacturer, we are able to provide these products in level, rounded and pear/bar shapes (see images above). And again, as a manufacturer, we also able to custom anodize using Pantone colors to match your specific brand requirements. We use high quality series-6000 aluminum alloy as the base metal, offering a sleek and solid finish that is very smooth to touch. We also use only the most advanced YAG and fiber optic lasering techniques for engraving our customers' names, designs and logos on our products which result in a crisp, white engraving. And our customers also enjoy the benefit of selecting from more standard colors — in fact, eight available anodized colors plus silver for customizing their items— including orange, red, purple, blue, green, gold, black and silver. All our products are certified lead-free, and we are also able to apply UPC coded stickers on the items for resale. Looking for a large quantity within a tight timeframe? Utilize our expertise and reliability in delivering large bulk orders, with industry leading lead times. Our streamlined manufacturing process allows us to deliver large quantities, with custom specifications, with critical in-hands dates reliably, efficiently and cost-effectively. 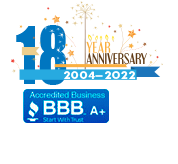 Our mission is always quality, convenience, and value — and whether a large or small quantity, contact us today to see how we can assist with your custom carabiner keychain needs at industry leading wholesale prices. available for qtys. of 10,000 - 500,000+. Please call for same-day quotes.